CAP is a 501(c)(3) non-profit organization, tax id: 33-00823225. Dues and contributions to CAP are tax deductible and help facilitate our art installations and educational programs. MISSION STATEMENT: Our mission is to increase the visibility and appreciation of art and serve as a catalyst for art education. Who we are ~ what we do ~ A little background ~ Community Art Project (CAP) is a non-profit arts organization established in 1998. 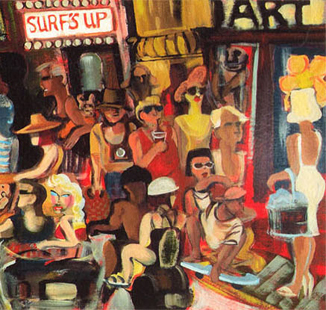 Among the founding directors were former members of the Laguna Beach Arts Commission, whose vision was to fill needs not met by existing City and private art organizations, including the facilitation of placing art work on privately owned sites. Since its inception, CAP has partnered with dozens of artists and private property owners in the downtown area to install sculptures and murals in the public view. CAP’s most recent installations include Troy Poeschl's " Embrace " sculpture, in front of Wells Fargo, along with the colorful mural called " Keep it Clean for the Next Generation, " on the south wall of Rocky Mountain Chocolate on Forest Lane at Coast Highway, created by noted Laguna artist Sandra Jones-Campbell with three students from Laguna College of Art and Design.